The Syncline Loop Trail follows a series of washes and canyons around the base of Upheaval Dome in Canyonlands National Park. This strenuous trail is difficult to follow and requires athleticism to negotiate the route’s steep switchbacks, boulder fields and slickrock. Only experienced hikers should attempt the loop. Anticipate longer travel times than the distance and net elevation change might suggest. Uneven terrain and frequent loss of clarity will compromise the pace. Carry extra water and take things slow so not to miss cairns that mark critical points. After a brief climb the trail levels in a cluttered landscape framed by sandstone domes to the south. It moves quickly to a dramatic gap that peers down a deep canyon (.88 miles : 5,590’), where you’ll begin a challenging 1.1 mile, 1075’ descent to the canyon floor. Tread carefully and remain navigationally vigilant on steep, twisting switchbacks that briefly moderate through 1.25 miles (5,284’). 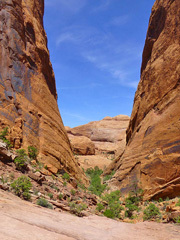 At 1.75 miles the trail crosses a slickrock wash to a pair of cairns that mark a second steep drop to the canyon floor. Travel moderates considerably once in the wash (2.0 miles : 4,515’), highlighted by mature cottonwoods and leafy brush. The trail generally favors the right side of the wash crossing and entering it several times. It briefly rises out to circumvent an impassable obstacle (2.5 miles : 4,373’), then drops back in. The canyon-wash narrows and becomes more convoluted through 3.0 miles (4,272’) but the way is intuitively followed. The canyon opens at the Upheaval Canyon Trail split (3.3 miles : 4,238’). It’s important to remain on the designated trail past this point (vs the adjacent wash), as it suddenly breaks left up stone steps (3.5 miles : 4,265’) to a terrace in a wide berth at the convergence of Upheaval Canyon and Syncline Valley. A few steps through brush flats lead to the Upheaval Dome access spur (3.6 miles : 4,325’). The trail veers left and levels by the designated campsite and seasonal creek of Syncline Valley. Cottonwoods line the creek corridor, a nice place to break. Pools large enough for soaking sometimes form but it’s advisable to leave these precious water sources to local wildlife. The trail rises sharply at 4.0 miles (4,335’) and begins a challenging course through boulders, brush and debris. Proceed with care and attention to cairns through the rock. The route is difficult to follow and exposed to steep drop offs. It reaches stone steps notched into a ledge (4.4 miles : 4,690’), just past which it scales a near-vertical rock slab that requires 3-4 points of contact. Conditions moderate in the upper canyon (4.7 miles : 4,780’), a lush riparian zone with large trees and grassy meadows. This is a great place to find wildlife. The trail weaves through tall grass and heavy brush past a seep located just off trail to the right (4.95 miles : 4,820’). Anticipate a sudden right turn and loss of clarity at 5.75 miles (4,925’) where the trail heads up a tall, rugged slot in the upper canyon (see map, points 18 – 19). Follow cairns closely. Once through the clutter it scales a steep slickrock slab with a great look down the slot you just navigated (6.0 miles : 5,060’). The trail moves to the left side of the slickrock and resumes an undulating course through a diverse landscape (6.5 miles : 5,285’). Travel quickens in and across several wash segments (6.5 – 8.0 miles), but remain alert for vague entry - exit points. Enjoy moderate intervals with variously rugged and ill-defined stretches on the final leg back to Upheaval Dome Trailhead (8.4 miles : 5,675’). This is a strenuous, primitive trail. Anticpate many steep and sparingly marked sections. Carry ample water, and expect longer travel times than the distance would suggest. Sturdy shoes with good soles are highly recommended. Only experienced and fit hikers should attempt travel on the Syncline Loop Trail. Water is ocassionally available in Syncline Valley, in either the creek or nearby springs. Shaded potholes may also hold accessible water. Natural water sources should not be relied upon. Most visitors choose to do the loop clockwise, perferable for having the sun at your back most of the day with an early start. Counter-clockwise travel tackles the boulder fields early on, which is arguably better than later when fatigue has set in. Despite proximity to Upheaval Dome, there are no views of it from the trail. A syncline is where rock layers have been bent so that they bow downwards or fold convex side down. The Upheaval Dome Trailhead is located 11.3 miles from the Island in the Sky Visitor Center on Upheaval Dome Road. "“Intense” I’ve done a lot of hiking in Rockies. Usually an 8+ mile 2000’ elevation change is moderate hike for me - NOT THIS ONE! It is difficult. Most of the route is a hard, but reasonable, hike. Follow the carns. Half way in, there is a very serious scramble. I am glad I went clockwise like various descriptions said to do (so you have the sun at your back and CLIMB UP the Breach). I would tell anyone who would listen to not go counter-clockwise unless you’ve already done the loop and know what your getting into. Go clockwise! Going clockwise - You start out relatively even, and then out of the sudden you drop. Drop like a rock off a cliff. And keep going down into the canyon bottom. Not very exposed, just steep, I can’t even think of trying to hike up that at the end, let alone in the dark as previous comments mentioned. Then your at the bottom and start heading toward “The Breach”. Very fun for a while in nice canyon foliage. The you start making your way up the cairns get harder to spot. I ran into a (upper 20-ish) solo hiker who was on the way down. All he said it was really “Intense” (repeatedly). But he looked and sounded like he saw Death. He was very relieved to know the hard part was past - yet he still had 1300’ elevation climb. Hence, my recommendation of going clockwise. I went on and sure enough it got hard and very scrambly. The exposure was moderate. There was one spot, I wish I had a helmet and considered turning back. A “good” fall wouldn’t be fatal, but could end in a really bad day. A bad fall or unlucky slip would be fatal. It’s my opinion that it’s a solid class 3 with exposure. If wet or icy, this is a serious technical climb requiring climbing gear. (If you don’t already know the terms “Scramble”, “Exposure”, “Class 2”, “Class 3” then this is the not the hike for you) The hard stuff was over when I got to the sign that said “Trail ->” pointing to the wall of rocks. After going over rocks and settling on flatter land I rested and calmed nerves under some shade trees. The Breach was more “Intense” than I had thought it would be. (Super happy I made it!) The rest of it was just a very pleasant hike up the drainages to the trailhead. I hiked in April and used 2+ liters of water and the high temperature was in the low 70’s F. "
"I am 74 years old and just completed the Upheaval Dome loop yesterday. I left Illinois a week ago (somewhat out of shape) and am planning to hike trails in the Southwest for the next two months. I started out at 9 a.m. and finished at 6 p.m. Temperatures were between 95-100° F. I took along about 3 quarts of water, which wasn't enough. I went counter clockwise and got through the most difficult climb (The Breach) with little effort. (I love climbing over boulders.) I made it to the Upheaval Canyon junction by 1:00 p.m. Then I reached the start of the final climb by 2:00 p.m. In the final climb I began to run out of stamina and nearly had a heat stroke. It took me four hours to finish the final 1.5 miles, which normally would have taken about 1-1.5 hours. This was a beautiful hike, and I would do it again without hesitation if I had the time. I would not call this a strenuous trail because most of it is relatively level. However, when temperatures are above 90°F it is important to take more water than you think necessary. If you are older like me and have more fat than muscle, you will sweat out more than you think and must replace the lost liquid. Also Gatorade is a good supplement because it replaces much of the lost salts. If your backpack is big enough, freeze the drinks before starting out (if possible) and wrap them in insulation. Drinks will be cold to cool the entire trip. And/or take along something like potato chips for extra salt and energy." " Let me start with this, I know what I did was stupid, now, and I learned, the hard way, to stay in my lane and limitations. ANYway, I wish I had read these comments before I hiked it, alone, in Feb, getting a late afternoon start at that, 245pm. I am not an experienced hiker by any means, although I have been on a few trails in Acadia, PA, VA and MD, all of which are clearly marked, I have never done anything like this. ...I made it to the upheaval split by 430pm and figured all I had was 4.9 miles left and if I hurried, I would make it before complete darknesse. I feel like up until this point the trail was relatively easy to follow. Once I got passed the grassy flat area, it really started to get dark quick, and once the sun went down, those carins are pretty much invisible. Luckily I had a flash light, a pound of beef jerkey and a gallon of water, so I wasnt completely screwed if I had to wait it out till morning. When it got completley dark, I litterly moved at a snails pace, did a lot of back tracking to the previous carin when I couldnt find a next one and did a lot of praying to God to help lead me out. I did not back track my way out because it was pitch black and drizzling and the last thing I wanted to do was navigate the rocks in those conditions. My only option was forward. My flash light eventually reflected off a road sign in the distance, so I just headed towards that, slowly, and was starting my truck around 850pm. DO NOT BE An IDIOT LIKE ME. I was stupid for thinking I could do the hike alone, at that time of day, and even more stupid for not turning back at the upheaval split when I still had plenty of day light. DO THIS WITH A PARTNER, if you're not experienced and bring a lot of water and bring some food. I got a lot of good pictures, but they arnt worth risking your life for. All that being said, this really is a great hike and I would love to do it again, but with a much earlier start and with a friend or two." "I did this hike alone last October, shortly after the park reopened after the government shutdown. Made a very early start on a nice cool day. To me the trail did not seem as hard as some of the above posts indicate. I went clockwise. The steep descent into the canyon was quite exciting and required care but I took my time, and it was not all that bad. Then it was pretty easy until the breach, which from a distance looked pretty bad but with great care to spot cairns it was not that hard either. At one point the cairns led through sort of a tunnel in the boulders. Missing this would probably result in having to do some pretty nasty scrambling. Following the cairns was not bad at all though. The key to this trail is to go early, go on a really cool day, and concentrate on the cairns and route at all times. Even on a cool day take lots of water. I think I took at least 3 quarts maybe more. Watch the route behind you carefully in case you lose the cairns and need to backtrack a bit. Its a great trail with very few people and incredible scenery. It is the number one trail I would repeat if I visit Island in the Sky again." "I completely agree with the John Harms. This is not what I would call a "hike" it is a hike with some climbing that could be fatal for an inexperienced "climber". I strongly urge people not attempt this hike (at least "the Breach" portion on the north side) unless they are in good physical condition, do not have a fear of heights, and have done at least some bouldering. I would not recommend going up the breach with a heavy backpack on. I would avoid this hike in the heat of summer and at night, even with a headlight. I absolutely would not take children who are not nearly fully grown on this "hike". A dog could not negotiate a few of the segments. At one point I had to hold onto and rotate around a projecting rock to get from one ledge to the next. At another, I had to pull myself up onto a ledge and slide my knee over the side to get up. Slipping or making a misstep could be fatal. Going clockwise by the time I reached the breach I did not have the water to go back the way I'd come. I do think clockwise is much easier (I doubt I could have safely descended the Breach). We only saw one other hiker in 6 hours. It is a very beautiful hike, but I have no desire to repeat it. The next day, I hiked 14 miles in the Needles(Elephant Hill to Chesler Park to Druid Arch and back to Elephant Hill) and drank half the water I did on the Syncline and had much better control of my leg muscles at the end." "I have to agree with the other post - this is not a straightforward 'hike'. I hike (and have led hikes) quite a bit in Colorado, and I've done a bit of desert hiking and some scrambling over the years (Class 2 and some low 3), so I didn't think this would be a big deal. I went the counter-clockwise route and got to the steep slickrock and boulder area, where it seemed impossible to get through safely (unless you're a really good scrambler and don't mind exposure), and it still wasn't clear where to go when I climbed up a bit and looked around (it literally looked like you would have to hop from big boulder to big boulder), so I just went back the way I came, esp. as I was hiking alone and out of my comfort zone. If you have good routefinding skills and like scrambling with exposure (probably a 3), this shouldn't be a big deal, but definitely be prepared and don't take this trail lightly. " "I won't give a detailed, blow by blow description of the hike as the existing trail description is right on. I want to add a few descriptive comments...we hiked counterclockwise, sort of a late start at 1:00 p.m., it was hot (98 degrees)...was with my grown son. We both carried 4 liters of water (Nalgenes) in a backpack, and except for a first aid kit, little else. At first was idyllic, saw a ram (not long horned sheep), made our way following the cairns, all was well. Then we hit the boulder field, a massive scramble along a poorly marked route including hops/jumps over boulder spaces with nothing to hold onto, where a missed landing could result in a horrible fall. There is a near vertical long slab that in our direction, we could slide down, can't imagine trying to scramble up. But it *is* better to navigate this section when you have your strength, not at the end of the hike. After the boulder section, the hike improves, almost enjoyable...eventually you make your way to the marker sign that indicates the trail direction to continue, and you get a false sense of hope that it'll be soon over...but eventually you come to grips that you need to make your way back up thru a series of rocks and switchbacks that leave you wondering if you will ever get out of that mess alive. We had a thunderhead making its way to our location, and it appeared that the daylight wouldn't be forever. So at that point, you need to push yourself to get out of there, climbing, and climbing, and climbing...your rest stops are short since you know you need to get going...you don't want to get caught in the dark out there. We both had headlights, but finding those cairns in the dark would be a challenge. By then we had about one liter of water each, the harsh heat was gone, so that wasn't a major worry. Our legs were strained and pained beyond belief, thoughts of tossing the backpacks went thru our heads. We finally found what could be considered the top, and navigated ourselves out of there to the trailhead. By then, walking was difficult, stumbling was more how it was. After reaching the jeep, and attempting to remove my boots, my IT band muscle cramped up so badly that I almost fell down. It took four/five days for the leg muscle pain to disappear, walking was a challenge for a couple days. Just wanted to put a little more description of how it was for those that are wanting to hike this trail. Words like strenuous, difficult, etc., don't come close to describing this hike, is more like canyoneering, rock/mountain climbing...it is definitely NOT a HIKE. Good luck...get an early start. It was just getting dark when we finished, took us 8 hours, and we weren't strolling along. Thankfully the thunderhead never got to us, and it never rained. We both are experienced, fit hikers, so don't fool yourselves thinking that this could be a cakewalk for anyone."